How long will the registration take? 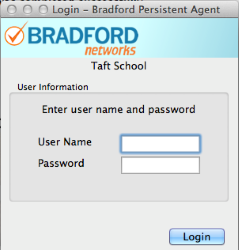 Can I just connect to the Taft Guest network? Can I use this process to connect my non-computer devices? Can I have my own wireless router in my room to connect my devices? My computer keeps going back to TaftAir-Guest instead of TaftAir-N. How can I set it to go to TaftAir-N instead? Students are allowed up to 4 connected devices. You will be able to connect laptops, smartphones, printers, ipads, desktops, etc. The registration process is very quick and simple. It will only take 3-4 minutes to get your devices connected to the network. At this time, you should not need very much assistance to complete the process. The Taft Guest network is only offered in specific areas of the campus, and only at certain times during the day. It also doesn't have access to on-campus resources, like printers, TaftNet, etc. Faculty, staff and students must register their devices get beyond these restrictions. This process is only recommended if you are registering a Mac or PC computer. If you are registering a mobile phone or a tablet device (iPad, Galaxy Note, etc. ), again click here to use the mobile device process instead. If you are trying to register any other types of devices (printers, AppleTV, etc), please contact us for assistance. 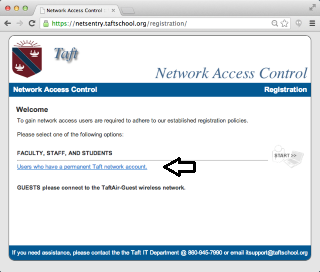 No, students are not allowed to connect routers to the Taft network. They are treated as rogue devices by the campus network. Go to System Preferences > Network > Airport > Advanced > find TaftAir-N in your Preferred Networks list, highlight and drag to the top of the list. Delete any networks you no longer use by highlighting them and clicking on the (-) sign. Go to Settings > Wifi > view the "CHOOSE A NETWORK... list > touch the "i" of the network you do NOT want to connect to > select "Forget This Network". Go to Start > Control Panel > Network and Internet > View Network Status and Tasks > Manage Wireless Networks > select TaftAir-N > click on Move Up to bring TaftAir-N to the top of the list. Go to the Menu button > Settings > Wifi button > Wifi Networks > select the network you do NOT want to connect to > select "Forget..."
Click on the link for Faculty, Staff and Students. The Client Registration page will open. Please read the instructions, noting that you will need to install a network agent on your computer. This agent will help you to ensure that you have the proper protections on your computer: McAfee Anti-Virus and operating system updates. Enter your network username and password and click Continue. 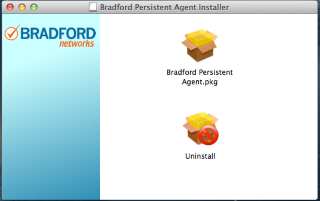 Follow all the installation steps until you arrive at the Bradford Login screen. Enter your username network password again. The agent will now complete the registration process. It will take about 45 seconds for this change to take place, and you should see a countdown and progress bar during the process. You will then be fully registered on the TaftAir-N network. From this point forward, you can re-connect your computer directly to TaftAir-N when you are connecting to the network. You should not have to go through any registration or authentication process again on this computer, unless you delete the persistent agent. If you are on a phone or an iPad, you may be prompted for the passphrase for TaftAir-N. The code is Rhino-2014. 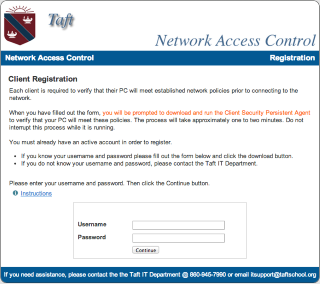 If you have any questions during this process, please call the Taft IT department at 860-945-7990.